Our internationally recognised transition to school program is comprehensive, with components for both families and children. Part of Keiraville Community Preschool’s role is helping children and families make a smooth transition to primary school. Throughout our normal preschool day, experiences available for the children are planned within our curriculum framework. These both capitalise on children’s current strengths and help develop our children’s skills, positive attitudes and dispositions to assist in a smooth transition to Big School. 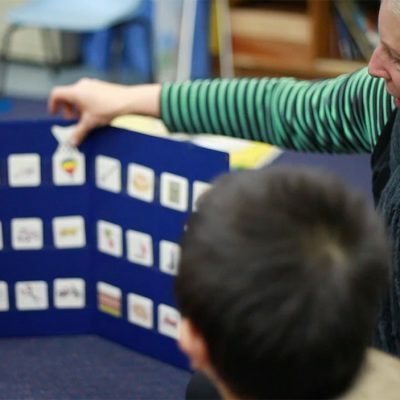 Develop relationships through Networking Morning teas – Children attending the same school in 2019 are introduced at morning teas held at the preschool. Photos taken of children attending the same school and included in each child’s journal. The children attending school the following year will work in the music room and courtyard from 11am to 12.15 pm daily during Terms 3 and 4.
develop positive attitudes to school through regular opportunities to dispel myths and discuss concerns. NOTE; All experiences reflect the EYLF and our commitment to children learning through play and the social interactions that occur naturally throughout the day. There is a strong literacy and numeracy focus without the use of stencils (work sheets), which are seen as inappropriate for this stage of learning. Develop Relationships through Photo Links. Photos of past preschoolers in their school setting are displayed to help children understand what happens at school and see people they recognise there. This fosters links and familiarity. Photos are taken of Kindergarten children as they return to visit to talk about their experiences and show how they look in their uniform. These are added to a display book called “People We Know at Big School” which is shared with other school starters. Children develop questions for the Kindergarten teacher prior to the Keiraville School visit and send a letter. Usually held in Week 8 Term 3. Teachers as Friendly People Kinder teachers from Keiraville Primary school visit, read stories and answer questions about big school. Children follow up with thank you letters. Children and educators will discuss the school visits and create stories relating to them. Orientation Support. Educators attending Orientation Days of schools our children will attend to provide support for the child, the family and the school. Orientation Memory A photo page is created relating to the child’s orientation day including aspects of the school and children’s experience. Support for Preschoolers with Additional Needs – Social Stories album is developed for children with additional needs or who need additional support. This includes photos of the child’s school, teachers, and appropriate school behaviour. Child Made Books -> Child Authors & Illustrators of their Journey to School With the support of families children take photos of their new school and at preschool create a “My Big School Book”. As they create their book children share their knowledge of their school. Family Feedback via Survey – Families share their priorities, thoughts, feelings and needs in the transition to school process via a survey. Survey results are collated and distributed to staff and the community of families. Partnership Development – Information is shared in an ongoing process between families and focus educators to foster the developing of partnerships in the transition to school process. A folder listing schools children will be attending is available in the foyer so families and educators can help foster friendships with children who will attend the same school. Suggestions on how families can help smooth the transition to school. Information Expo – Local Primary school Principals (DET and Catholic systems) are invited to speak to families about the school systems and the transition to school process. This is now held at the Keiraville Primary School Library. Minutes are taken and distributed. Networking Morning teas – Families and children attending the same school are introduced at morning teas held at the preschool to help relationships A parent mentor (from a family already attending the school) attends the morning tea to provide first hand information to new families. TTS Sharing Form – A statement provides information for schools from the families, educators and the child. Families are invited to contribute to this statement. Exit Survey families for feedback on the transition program and ideas for improvements. Journal Sharing – Families are encouraged to share their child’s journal with their Kindergarten teacher to promote better understanding of their child and their background experiences. Letters are sent to schools outlining the KCPS Transition Program and inviting a partnership approach. Invitations are made for teachers to visit our preschool, see the program in action, meet the children, suggest ways to foster a partnership in the Transition to School process, and explain the philosophy behind an educator attending the school’s orientation day. Information Expo – In collaboration with local Primary school Principals (DET and Catholic systems) an evening is held to discuss the transition to school process. Minutes are taken and distributed so families who are unable to attend are kept informed. Educators attend Orientation Days at schools our children will attend in 2018 to provide support for the child, the family and the school. Support for Keiraville Primary School’s Transition Program. Meeting with the school to share ideas and discuss how best we can support their transition program. An educator is freed to participate in the classroom with the children in the school’s Transition Program. Educators attend Local Transition Functions – Picnic in the Park for school starters. TTS Statement Sharing Form – A 2 page statement has been developed providing condensed information for schools from the families, educators and the child. A feedback and evaluation form is provided to assist KCPS to improve the information sharing. “Building on children’s prior and current experiences helps them to feel secure, confident and connected to familiar people, places, events and understandings. Children, families and early childhood educators all contribute to successful transitions between settings. In partnership with families, early childhood educators ensure that children have an active role in preparing for transitions. They assist children to understand the traditions, routines and practices of the settings to which they are moving and to feel comfortable with the process of change. Keiraville Community Preschool acknowledges early childhood as a valuable stage of life, important in its own right and not solely a stepping stone to formal education. It is vital that the child’s capacity for joy, curiosity and love of learning today is not compromised by the preparation for tomorrow. The embedding of “Transition to School” in a rich play based curriculum respects children’s rights of “Being” as well as the “Becoming”. Throughout our normal preschool day experiences available for the children are planned reflecting the EYLF. These both capitalise on children’s current strengths and help smooth their transition to “Big School”. We aim to develop our children’s skills, positive attitudes and dispositions. Keiraville Community Preschool pays respect to the Dharawal people as traditional owners who have, and continue to nurture the land on which our preschool sits. We acknowledge the consequences of the impact of white settlement for people, communities and our nation. We believe we can walk together to a better future and are committed to Reconciliation and to promoting greater understanding of Aboriginal cultures within our preschool and the wider community. KCPS is supported by the active participation of our preschool family and the community. On joining our preschool, families become part of the Association that owns the preschool. Make sure you view our friendship tree on your next visit. © 2018 Keiraville Community Preschool. All Rights Reserved. Website by EP.